Often food industry requires papers, formats and specific machining suited to their automatic machines, for mass production of products. We carry out very particular processing on food papers. For example, very small sizes and punctures. We adapt our production to the specific needs of the customer. 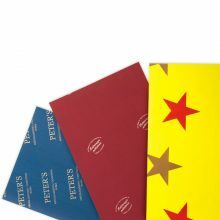 The machine glazed Kraft paper gr.50 is a very versatile economical and well formed white paper. 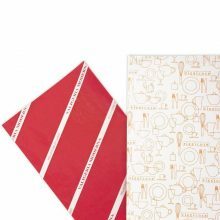 It consists in pure cellulose and is easy printable with logos and full backgrounds. It is the most used paper by industries for different uses, protective ones and metallizations. It is often used for security seals toilet cover for instance. It is often used by chain stores as counter paper.